I love this dish. Love. It. A while back, a friend and I were discussing what to do with her CSA surplus. What DOES one do with extra parsnips? Does anyone know what to do with a parsnip anyways? Well, I actually had tried making this recipe last year with some root vegetables that were on super sale at the store after I had seen a feature of Sophie Dahl (her grandfather, the famous children’s author, Roald Dahl) in one of my favorite food magazines, and I loved the flavors that resulted. The salad is served warm, with a Dijon-balsamic glaze. Which, honestly, might sound a little yucky, I’ll admit. But, I promise you, it’s delicious. I love this meal so much that I will pack it for three or four days straight in my lunch at work, and I always look forward to heating some up (which is a rare thing for me, since I really don’t like leftovers…..). I decided to make it again a few weeks ago, and here is my solution for what to do with your CSA surplus. Now, I am a huge fan of Sophie Dahl. Every time I go to the bookstore, I head over to her new cookbook, but I have yet to purchase it. It’s on my Christmas list, for sure. I really hope you like this. The mixture of colors, textures, earthy flavors with the tang and saltiness of feta….I could seriously eat this amazing (and super healthy) meal everyday. 2. In a roasting pan, toss the onion, sweet potato, carrot, parsnip, celery root (and/or butternut squash), and beet with two tablespoons of the olive oil. 3. Season the vegetables with salt and pepper and roast for about 45 minutes, stirring once or twice, or until tender and lightly browned in spots. 4. Meanwhile, spread the walnuts in a nonstick skillet and toast over medium heat until fragrant and lightly toasted, about 6 minutes. 5. Once the walnuts have cooled, coarsely chop and set them aside. 6. In a large bowl, whisk together the lemon juice, balsamic vinegar, mustard, and the remaining tablespoon of olive oil and fold in the parsley. 8. Add the vegetables and the walnuts to the dressing and toss. 9. 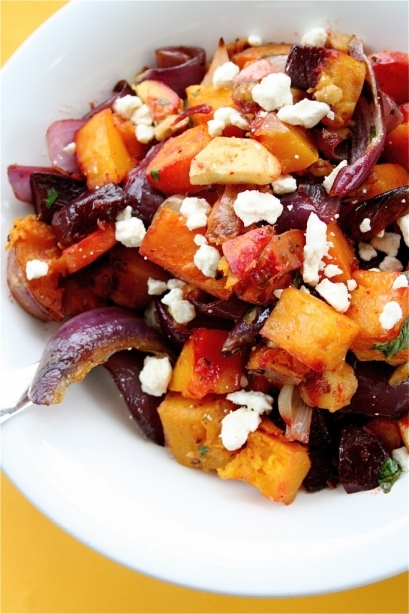 Top the salad with the feta and serve warm or at room temperature. Source: Sophie Dahl at Food and Wine.